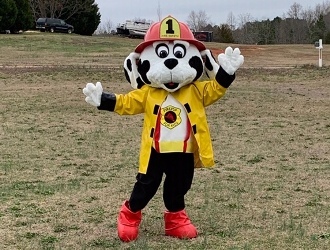 Pike County's very own Lt. Danielle Kelly as Sparky! Photo courtesy of the Pike County Fire Department. ZEBULON - A major key in keeping our community fire safe is awareness and education! With this thought in mind, the Pike County Fire Department is working with National Fire Safety Council, Inc., a 501(c)(3) non-profit organization, to provide fire prevention materials for our community through their Annual Fire Prevention Program for the citizens of Pike County. These materials will be extremely effective in providing important information and valuable resources for our community. Some of the materials we have carefully selected include activity manuals, brochures, booklets and other valuable teaching aids. A broad range of critical topics are addressed in these materials, including How to Report a Fire: 9-1-1, Home Fire Safety, Crawl Low Below the Smoke, Smoke Alarm, Carbon Monoxide Detectors, Fire Extinguisher Awareness, Burn Prevention, and other community concerns. The Pike County Fire Department will distribute these materials through presentations, activities and programs in our community. “This information is a great tool to help children, parents, teachers, and our community better understand and respond to the challenges and education needed to help protect our citizens every day,” said Chief O'Barr. The department is asking for the support of local businesses, by donating to help cover the cost of the materials they will be distributing. Your tax-deductible contribution will be used to provide fire prevention education materials for our local community. All donations are appreciated! In recognition of their generosity, the name or business name will be listed on the materials distributed in our community. Michael Autry, state safety coordinator for National Fire Safety Council, Inc., will fully coordinate the program including materials, donations, and delivery, along with Lt. Danielle Kelly. I WOULD LIKE TO POINT OUT THAT THIS IS THE ONLY FIRE SAFETY EDUCATIONAL PROGRAM THAT THE PIKE COUNTY FIRE DEPARTMENT HAS ENDORSED THIS YEAR. IF YOU ARE CONTACTED BY A SIMILAR PROGRAM, PLEASE CALL ME IMMEDIATELY. Please accept my sincere thanks and appreciation for your consideration of this worthwhile project. Through our partnership, we will be able to work toward providing a safer community for all of our citizens. If you have any questions, or need additional information, please contact Public Information Officer (PIO) Anita Neath at (770) 468-2238.